After saying this, he (Jesus) was taken up to heaven as they watched him, and a cloud hid him from their sight. They still had their eyes fixed on the sky as he went away, when two men dressed in white suddenly stood beside them and said, "Galileans, why are you standing there looking up at the sky? This Jesus, who was taken from you into heaven, will come back in the same way that you saw him go to heaven." The story is told about the Ascension Day celebrations at a particular seminary. A special Ascension Day service was held and the whole seminary in robes and regalia gathered for the big celebration. It was quite an event. The service ended and, amidst clouds of incense, the assembly emerged from the chapel singing some great ascension hymn. Unknown to the worshippers, a somewhat creative student had found one a near life-size Christmas crèche figure - the hollow, plastic painted kind - and stuffed it with fireworks – the sky rocket type. As the procession marched into the courtyard, the student lit the fuse, sending the statue soaring up out of the shrubbery through a cloud of smoke and sparks. It buzzed over the scattering members of the procession, finally taking a nosedive on to the roof of a nearby building. There the ascension rocket sputtered and died. The head of the seminary was not impressed with the student’s explanation that he was simply trying to dramatise his faith in the ascension of Jesus. At least one thing can be said about that Ascension Day celebration is that it was never forgotten. But as a rule Ascension Day is hardly remembered. There is no special holiday to mark the occasion. It was work as usual for most of us last Thursday. I dare say that not even many Christians remembered Christ’s ascension to heaven as they went about their busy lives. We don’t even talk about Jesus ascending to heaven very much because to the modern mind it is quite humorous to think of a man suddenly lifting off the ground and disappearing behind the clouds. Perhaps images of the cartoon character Superman comes to mind who had the ability to just lift up his arms and take off into the sky. As some have said, "Nothing in our world goes up except rockets, the cost of living and unemployment statistics". The whole prescientific concept that Jesus went up to heaven defies modern understanding of the universe. "Up where? ", people ask. "Into outer space, a planet, a star?" The ascension story doesn’t fit into modern thinking anymore; it’s not mentioned in the Bible very much and it falls on a workday. Who needs it? Believe it or not Christ’s ascension to heaven adds quite a bit to our understanding of the Christian faith. St Augustine expressed his opinion about Ascension Day like this: "This is that festival which confirms the grace of all the festivals together … For unless the Saviour had ascended into heaven, his Nativity would have come to nothing ... and his Passion would have borne no fruit for us, and his most holy Resurrection would have been useless." In other words, Christ’s ascension is in an essential part of the gospel message. Today I want to look at the Ascension from two points of view – the majesty and then the ministry of the ascended Jesus. Firstly, the majesty of the ascended Jesus. The details of what happened that day outside of Bethany are sketchy. We are simply told by Luke: "After saying this, he was taken up to heaven as they watched him, and a cloud hid him from their sight." (Acts 1:9). The cloud that hid Jesus from their sight had nothing to do with the atmospheric conditions that day. This cloud was no ordinary cloud; it signified the divine presence of God. The same cloud that led the people of Israel in the wilderness, the same cloud that covered Mt Sinai, the same cloud that settled on the Mount of Transfiguration. Again and again in the Bible, clouds indicate the presence of God. Jesus being lifted up into this cloud represents his exaltation to the highest place again as the eternal, transcendent God, one with the Trinity. He who "humbled himself and became obedient unto death" is now the exalted Lord of all. Then God gave Christ the highest place and honoured his name above all others. So at the name of Jesus everyone will bow down, those in heaven, on earth, and under the earth. And to the glory of God the Father everyone will openly agree, "Jesus Christ is Lord!" (Phil 2:9-11 CEV). I think you get the picture. Jesus Christ has no rival to his power in this world or in the spirit world. He is eternally triumphant and he will reign forever more! His power far exceeds that of Satan or death. No matter what problems we face, Jesus rules with power. When our prayers contain the seeming impossibility, nothing is beyond his power. That leads me to my second point – the ministry of Jesus. There is little point in having a God who is exalted and majestic, if he doesn’t touch our lives in some way. The queen in Buckingham Palace in London who is surrounded by majesty and honour has very little effect on our every day lives. If there were to suddenly be no queen, I’m sure our lives would hardly be affected. That can’t be said about Jesus. 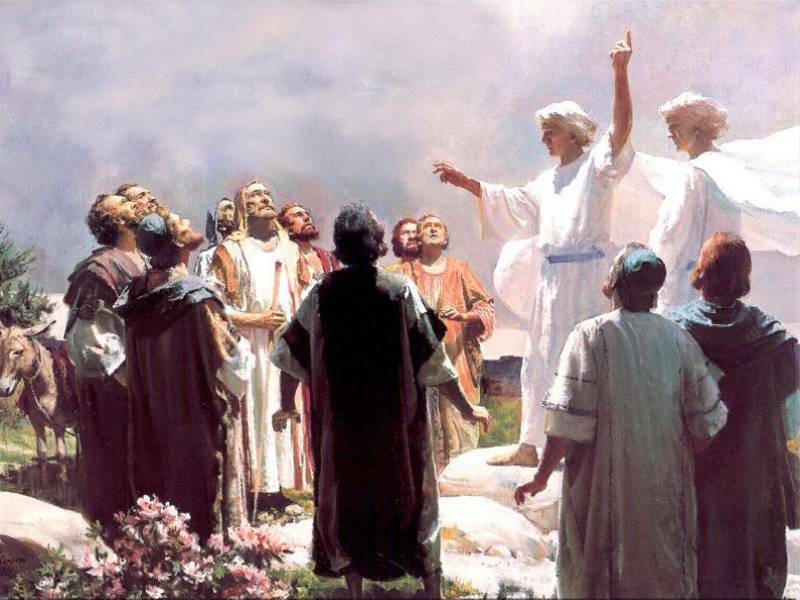 As Jesus was ascending to heaven we are told by Luke that "he raised his hands and blessed them (the disciples) (Luke 24:50,51). I don’t think we hear of Jesus raising his arms in blessing at any other time so to me this is a very significant action. He had just told the disciples that they were to be his witnesses of the things they had seen and heard. He was telling them and us how important it is to reach out to those who do not yet know about Saviour of the world. I’m sure he knew just how difficult this task was going to be. Matthew records the last words of Jesus and perhaps this was the blessing that Luke is referring to – "I will be with you always, to the end of the age" (Matt 28:20). Letting my imagination run a bit I can visualise Jesus slowly ascending and as he gets further away he calls – I will be always with you. I will always be with you. We may not be able to see him with our eyes, but his presence is still with us. When it seems that life has caved in around us – failing finances, the fear of world disasters, the threat of disease and death, guilt that never seems to go away, relationships with others that don’t get any better – the presence of Jesus is never far away. When it seems that we will never overcome our temptations, that sin is always getting the upper hand in our life, Jesus is never far away with his grace and forgiveness and grace. When it seems that all there is in the future is gloom, hopelessness, worry, and death, Jesus reminds us – I am with you always. He is ready to help when we turn to him with sighs and cries of hopelessness. He is ready to use his power to answer our prayers. He even prayers for us before the throne of God. It’s great to know when people are praying for us but when we are told that Jesus is praying for us, that’s quite something. The ascension assures us that our future is secure in the hands of the Lord of all. Jesus raises his hands of blessing over us. Jesus doesn’t only minister to us – he ministers to others through us. I have already touched on the importance that Jesus placed on being his witnesses. An ancient legend tells of the return of Jesus to glory after his time on earth. Even in heaven he bore the marks of his earthly pilgrimage with its cruel cross and shameful death. The angel Gabriel approached him and said, "Master, you suffered terribly down there. Do they know and appreciate how much you loved them and what you did for them?" Jesus replied, "Oh, no! Not yet. Right now only a handful of people in Palestine know." But Gabriel was perplexed. He asked, "Then how will people learn of what you have done and your love for them?" Jesus said, "I have asked Peter, James, John, and a few more friends to tell others about me. Those who are told will tell others in turn. And my story will be spread to the farthest reaches of the globe. Ultimately, all of humankind will have heard." Gabriel frowned and looked rather sceptical. He knew what poor stuff humans were made of. He said, "Yes, but what if Peter and James and John grow weary? What if the people who come after them forget? What if they just fail to tell? What is your alternate plan?" Jesus answered, "There is no other plan." How will others get to know of God's saving grace and the power and the love of Christ available to them, if not through us? Through us his disciples Jesus brings comfort to the sick and the dying, he gives friendship to the lonely and the stranger. Through us he comes into the hearts of others when we grasp windows of opportunity that arise in our daily dealings with others to share what it means to know Christ and the comfort that comes from knowing that he is near and ready to help in times of need. When the disciples were gazing up into the sky to catch a final glimpse of Jesus two angels told them Jesus will return. We are in the time between the ascension and Jesus’ return. The Kingdom of God has come but it is not yet here in all its fullness and completeness. As we wait for God's Kingdom to come when Christ returns, we have been given the task of carrying on Christ’s ministry. As we wait, we are called on to trust in the Lord – remember he has all power and authority – he has promised his continual presence. When those disciples had seen Jesus ascend they went back to Jerusalem where they worshipped God. Today let us join with them and with those gathered around the heavenly throne and give glory to our ascended Lord and King who has promised his help and presence as we live in this age before his Second Coming. Let's get on with it and live for Jesus carrying out the task, the ministry, he has given us to do.